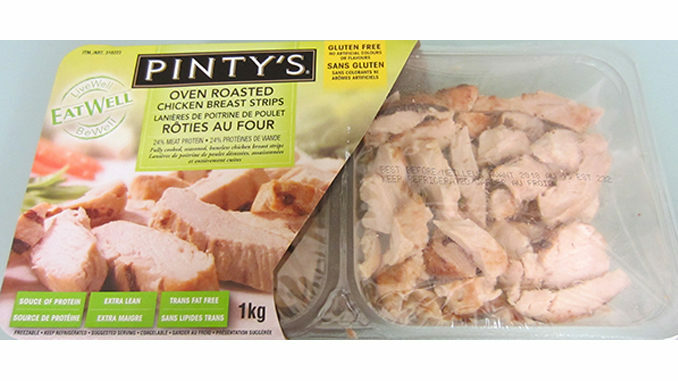 Health Canada says Pinty’s Delicious Foods Inc. is recalling Pinty’s brand Oven Roasted Chicken Breast Strips due to possible Listeria monocytogenes contamination. The recall affects the brand’s Oven Roasted Chicken Breast Strips with best before dates of August 9, 2018 and August 15, 2018, with the UPC code of 0 69094 62401 1. The recalled strips were sold in Alberta, British Columbia, Manitoba and Saskatchewan. Consumers are being advised not to consume the recalled products. Health Canada warns that food contaminated with Listeria monocytogenes may not look or smell spoiled but can still make you sick. The agency says pregnant women, the elderly and people with weakened immune systems are particularly at risk.